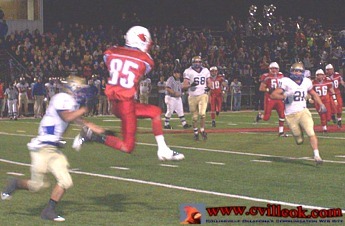 Collinsville held Oologah on downs on their first possession and then drove from the Cards 27 yard line down to the 18 yard line of Oologah before losing a fumble with 3:43 left in the first quarter..
John Pinney (#85) caught this Shane Douglas pass for a first down at Oolgah's 33 yard line in the Cards 1st possession. 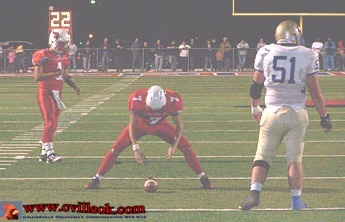 Oologah scored the only first half points on this field goal at 7:26 in the 2nd quarter. 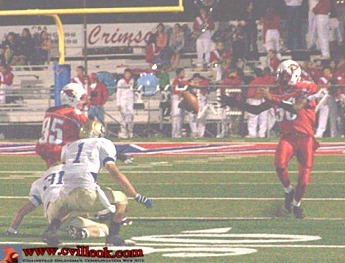 The drive started after recovering the Collinsville fumble at the Oologah 27. 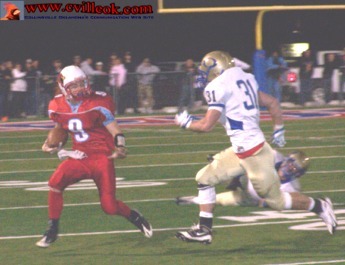 Shane Douglass (#9) reached Collinsville's 45 on this keeper then got 15 more after being flung down out of bounds. The Cards eventually got down to Oologah's 13 with under a minute left before half time on just their 2nd possession of the game. The gains came on rushes by Merin Oakley, Steven Majike, Tyler Lowe and Douglas. 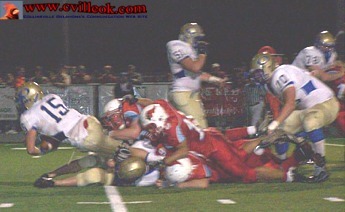 The 2nd Collinsville drive stalled with 4th and 4 at the 13 with 56.9 seconds left in the 2nd quarter. 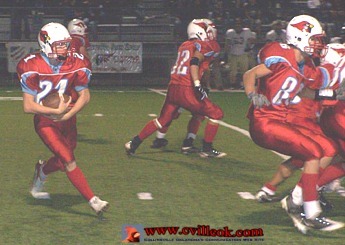 Collinsville was still sitting up for a field goal attempt in the photo above before shifting into a normal formation. The snap was not handled but holder Tyler Ames (#1) got off a pass which was intercepted by Oologah in the endzone and returned out to the 4 yard line with 47.3 before the half. Collinsville was just 3 points down until Oologah scored on a 70 yard drive (above on a 1 yard run) at 6:57 in the 3rd quarter. The PAT kick was low putting the score at 0-9. Shane Goossen (#21) returned this Oologah kickoff (after the score reached 0-16 with 2:33 left in the 3rd quarter) to the Cardinal 25 to start their 2nd possession in the 2nd half. 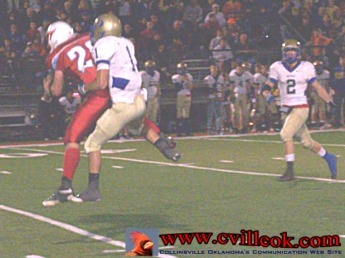 Joe Keith (#28) caught this long Shane Douglas pass down to Oologah's 32 yard line on the first play of the 4th quarter. The drive stalled after a bad pitch and a penalty. The Collinsville defense pushed the Mustang ball carrier backwards for a loss back to the 12 yard line following a James Norris punt to the 15 early in the 4th quarter. Oologah's only punt of the game (on 4th & 5 at the 20) looked like a normal punt to begin with, but when it hit the turf it started a major roll back in the opposite direction. 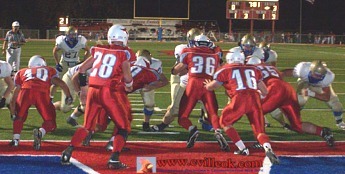 After an Oologah block in the back (right) Trevor Rabbitt (#32) picked up the ball and got near the Oologah 5 yard line. The officials held a long conference before finally placing the ball at the 3 for a Cardinal 1st down with 8:02 left in the game. Merin Oakley (#30) scored Collinsville's only points on a 3 yard run at 7:29 in the 4th quarter (after Oologah's backward punt). A rushing attempt for a 2-point conversion was fumbled/recovered and short for the final 6-16 score. Collinsville only got the ball back one more time after Oologah chewed up clock moving down to the 15 before turning it over on downs with less than 20 seconds left in the game. 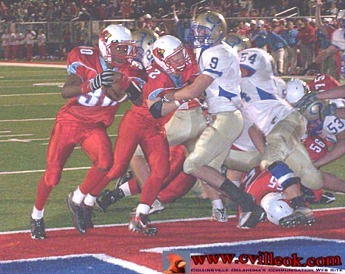 Collinsville attempted a hook & ladder play with John Pinney (#85) catching the hook pass but the pitch to Merin Oakley (#30) trailing the play was just short and he went to his knee to recover. A spike to stop the clock and two incompletions ended the game. 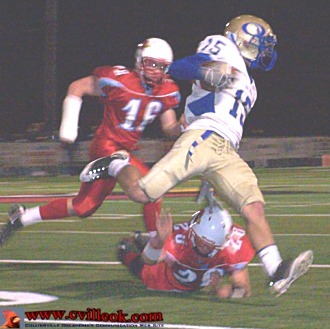 Oologah's Josh Collier (#15) carried the ball 37 times for 150 yards according to the Tulsa World. He just eluded Joe Keith (#28) and still had Jayce Crowder (#16) chasing with his padded cast in the final drive. Crowder was back in the lineup after being out since the Catoosa game with a broken wrist.